Newsjacking: An eternal weapon to boost up your email open rate! March 10, 2014 | -by: Kevin George. Newjacking is an interesting concept. It’s the act of leveraging on the momentum of breaking news and turn the same into your company’s favor by injecting a fresh perspective in real time through a blog, email, tweet or anything digital that creates engagement. Blending this very interesting concept with Email Marketing can instigate the fun and engagement quotient of your subscribers. Blending it in right time can make all the difference, you have had always desired. 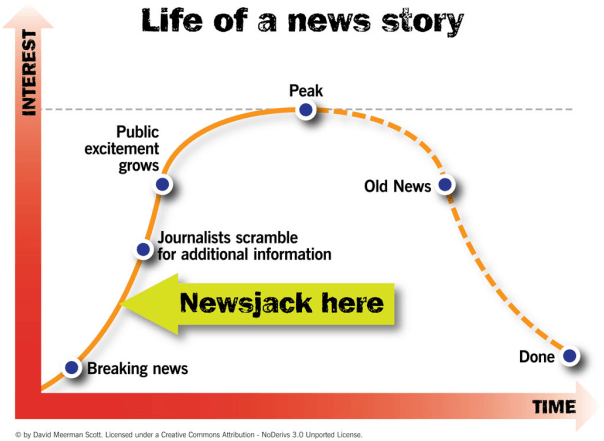 Here’s a great image that talks about when exactly to Newsjack. You can view more about it in detail on Webinknow’s website. So, how to successfully incorporate Newsjacking within your Email campaigns? Monks discover it! Look around to see what’s trending! There are brands that have been leveraging on the current affairs and increasing their email opens and clicks. However, this also should go in sync with the overall email theme and the products or services offered therein. Keep your eyes and ears open to track the latest news and try to set up alerts about the latest news. Apart, research on the most popular keywords that have a greater search volume. It is better to cross check the facts and news from a variety of sources before syncing it with your email campaign. Make sure that the news isn’t fake, otherwise it can really put you in the troubles waters. Mention the references and sources of the news, if you plan to link it up with your email copies. Subject lines are really powerful weapons to incorporate Newjacking. If you have a Valentine Special email with a subject line “We offer love to our subscribers” make sure the love is really offered through visuals and attractive offers. May it be the latest Oscar awards, Presidential debate or the Olympics game, leveraging the latest news with appropriate email subject lines surely work wonders. It’s vital that your email stories are drawing an analogy between your email campaigns and the news you have hijacked. If your subscribers aren’t much interested about the news you have picked, you might lose out opens on that campaign. Thereupon, linking the two of them is important. You need to connect the dots through a story telling with the news as a base. Explain why the news you just picked relates to them and your business niche or product offerings. Don’t restrict your newsjacked content to email campaigns. You can always add forward to a friend and social sharing options in the email, but go the extra mile. Refine and packet the same into a blog, infographic or any other relevant content piece so that outside your subscribers, many others can relish the content you newsjacked. Try to market the same across the social channels. The best way to Newsjack is to include live news or social feeds right there in your emails, automatically updated at open-time. Here’s an example that we used in our ecommerce expo emails. The news content will continue updating pretty much forever, even though the emails were sent a month ago.